This atlas was produced as a part of the OSFAC (Observatoire Satellital des Forêts d'Afrique Centrale) initiative “Monitoring the forests of Central Africa using remotely sensed data sets” (FACET in French). FACET is led by OSFAC in collaboration with South Dakota State University and the University of Maryland, and supported by USAID CARPE. Additional support was provided by World Resources Institute. The background image on the cover is an excerpt from the “Nouvelle et Correcte Carte d’Afrique tirée des meilleures autorités” created by Thomas Bowen in 1778. FACET (Monitoring the forests of Central Africa using remotely sensed data sets) is an OSFAC project whose goal is to quantitatively evaluate the spatiotemporal dynamics of forest change in Central Africa through the use of multi-temporal satellite data. The series of multi-temporal data from the FACET project will be a useful contribution to many environmental and planning projects. All results will be made available to the public. The DRC FACET publication is the result of a study of forest cover and forest cover change in the Democratic Republic of Congo (DRC). The analysis made use of an automated "wall-to-wall" remote sensing method, developed jointly by South Dakota State University and the University of Maryland, and incorporated over 8,000 Landsat ETM+ images. The atlas consists of Landsat image composites coupled with classifications of forest cover and forest cover loss for the periods 2000-2005-2010. We hope that this publication, which seen as a step towards a regional platform, will be the first in a series allowing the diffusion of useful and timely information concerning forest change dynamics in Central Africa. 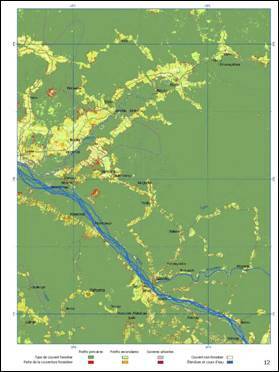 There are myriad uses for the thematic data and image composites provided with the DRC FACET Atlas such as: natural resources management including forests, biodiversity, wildlife habitat, protected area and mineral exploitation management; land use and transportation network planning; watershed and surface water monitoring; agriculture monitoring and planning. In addition, when combined with the appropriate carbon stock inventory data, the FACET methodology and data provide the capability for carbon monitoring for REDD and/or carbon markets. The FACET Atlas provides a thematically simple map of relatively few forest cover types and change. Mapping the occurrence and type of forest cover change is the first step in identifying and analyzing the drivers of deforestation such as agriculture, logging and charcoal production. The forest cover change image and the two landsat image composites contain a readme file with data description and use instructions. A readme file is also here. If for any reason your not able to use the ftp directory, please contact us. As the Landsat image composites and high resolution atlas were very large files (about 1 GB each for the composites and 500 MB for the atlas), they have been provided as a multi-part RAR files. The download times will be faster and there will be less chance of data corruption due to long download times. RAR files are simply compressed folders that will recompose themselves when you extract them. You will have to download compression tools to extract the data. Download and install winRAR (Windows) or the unarchiver (Mac) from the same FTP folder (ftp://congo.iluci.org/FACET/DRC/) or download the tools from the following websites. Windows: http://www.win-rar.com/download.html, and Mac: http://wakaba.c3.cx/s/apps/unarchiver.html. Download all the RAR parts. Put them in the same folder. Double click on one of the RAR parts and it will recompose the other parts into one file. The Statistics document was written by OSFAC team for a better understanding of FACET atlas. This publication is a summary of statistics produced from the FACET main document. These statistics (in ha or thousands of ha) were automatically deducted using the tool “Tabulate Area” of “ArcGIS” software. It was followed by treatment on Excel to the end of getting the various statistical tables. A multitude of information and statistics could be drawn from FACET publication. Download Statistic document (PDF, 48 MB). 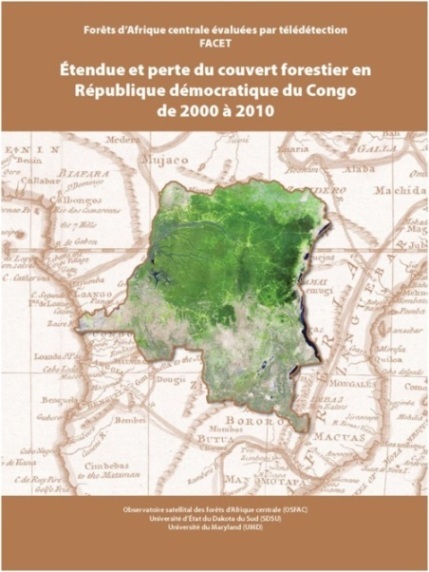 The examples in this document relate to statistics on the extent and loss of the forest cover in landscapes, protected areas, forest concessions, the provinces and around major cities in the Democratic Republic of Congo. In total, between 2000 and 2010, the rate of deforestation in the DRC is around 2.34%, respectively 1.09% between 2000 and2005 and 1.25% between 2005 and 2010. 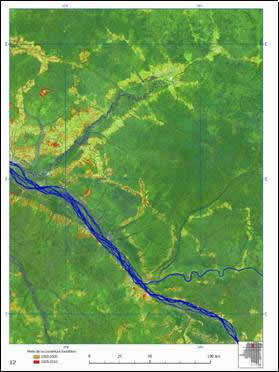 Monitoring the forests of Central Africa using remotely sensed data sets (FACET), 2010. Forest cover and forest cover loss in the Democratic Republic of Congo from 2000 to 2010. © OSFAC, 2010 Please let us know of any publications or formal use that you make of these data and products, and remember to reference the material according to the readme files.